Hello Janet. Long time it has been since we last conversed but I wanted to reach out to you and say hello.We have Not seen or heard of ANY coyote issues within the past 4 months or so? No neighbor’s have come to me like they had been doing most of last year, particularly over the warm Summer months? Don’t know what happened to them and that causes concern? It is like they vanished from this immediate neighborhood and those surrounding us? Could it be they went into some kind of hibernation period? Anyway, just wanted to let you know I had not forgotten about you and our plight and wanted to reach out. Hope you and husband are doing well and your life is moving along in excellent and divine order. Warm Regards, Joyce White, your watch captain in Los Angeles. Hi Joyce. I, too, have noticed a fall in visibility of coyotes in many of our parks here in San Francisco over the last few months. They’ve gone from being recurrently visible during the light hours of the day to rarely if at all sighted during these same hours. Yet I know that the same coyotes are still in the same parks because I hear them routinely (I recognize them by their individual yips and howls) and I do see them ever so sporadically — so it’s just that their activity schedule has changed perceptively. I’ve in fact seen a couple of lone coyotes appear in small neighborhood open-spaces where coyotes had never been seen before — I was genuinely thrilled to see these a couple of times during the four days they each remained there — but after about a week each was gone and has not returned. As far as I have seen, the number of sightings tends to run in waves — there’s an ebb and flow to this. During these times of increased sightings, some people post their reactions on social media which has a tendency to amplify the extent of the sightings. Where folks have seldom or never seen them, there is a tendency to believe that coyotes are “taking over” when they are finally seen. And, if there have been any incidents — such as unexpected encounters or confrontations which are often understandably frightening for unsuspecting dog walkers — the severe negative reaction posted on these sites is strong and the “solution” folks think of is, “let’s get rid of them” or “let’s relocate them”. Incidents may be discussed for months on social media such as Facebook or Nextdoor, often based on misinformation about coyotes, and with the fear factor driving these comments and often spiraling up the ante. The increased sightings may last a couple of weeks or several months, as they did last Summer and Fall, but then they subside. Be they visible or not, everyone should know that coyotes are not interested in humans — they’ll do their best to keep away from us. Pets, on the other hand, pique their interest for various reasons. 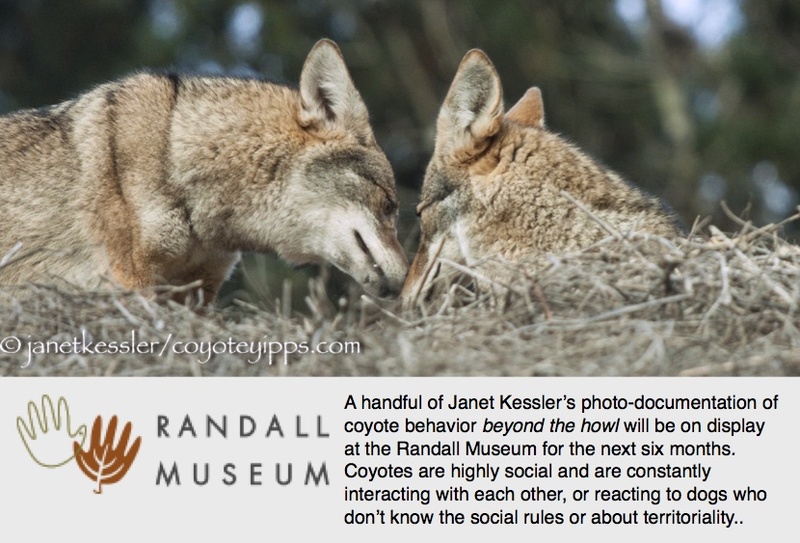 Please learn how to protect your pets by knowing about coyote/dog behavior and by knowing and following some simple guidelines: see “Coyotes As Neighbors“, a 30 minute video presentation to learn more. Changes in coyote visibility — number of sightings — appear to be tied to individual coyote family dynamics: I’ve noticed that when a family has become disharmonious for various reasons, these coyotes are out in the open more. Last year during pupping season, adult coyotes were as visible as ever in one of the parks — there was intense rivalry going on in that family. This year, the reverse is true: things are pretty quiet on the coyote front for now and visibility has shrunk to practically nil. Come late summer, coyotes will again be out more as parents take youngsters out of their more protected hideouts into the larger world. In addition to the changes which occur within each coyote family, including during every pupping season, one should keep in mind that in California, we finally had rains which have helped with the stressful drought conditions for our wildlife. Our coyotes, which were more visible several months ago when drought conditions were affecting them, are less so now, and the ending of the drought might be a factor. I’m told that it normally takes about 8 months for an ecosystem to begin returning to non-drought conditions. Droughts cause wildlife, including coyotes, to venture further afield in their search for food — because there is less of it where they normally hunt — and it causes them to remain out longer in search of that food. With weather conditions and the food supply returning to what is more normal, coyotes again are shrinking back into their more hidden areas and they have shortened their hunting hours. NOTE: I’ve been photo-documenting urban coyote behavior first-hand for the last ten years, as a naturalist with a background in Ethno-Anthropology. I’ve observed fluctuations in sightings and coyote behavior over time. In all cases which I have seen, increased visibility and incidents always cool down — they ARE NOT indicative of a “progression of aggressiveness” nor an increased danger to humans as contended by Baker and Timm (2007). These authors relied on compilations of reported sightings and incidents by others for their report, not on first-hand field work as I have here. I’m adding my own research to the pot for a better understanding of what is going on.